Saving the Wild’s Year End 30 June 2017 performance report has just been filed and can be viewed on the New Zealand charity website; charity number CC52014. Zululand in South Africa is the new ground zero in the rhino crisis, and if we lose the war on corruption – we will lose. The investigative process from ‘start to justice’ takes months and years, and because we want to illustrate a clear continuum of investigations from January 2016 through to the end of this year, we’ve included a two-year snapshot of milestones. There is nothing fast and easy about exposing and eradicating the cesspit of corruption that is enabling rhino poaching in South Africa. It is dangerous and expensive work, but we have now reached the tipping point between extinction and a revolution. Two years ago, if we had said Saving the Wild would investigate and expose two major KwaZulu-Natal syndicates over the next two years, one headed up by an alleged rhino poaching kingpin, and the other by a crooked justice official – and we’d do it with a budget of less than US$100 000 – I don’t think anyone would have believed us. As for the internal parks corruption we have exposed, make no mistake, this is just as serious as the criminal activities going on outside of the parks. We were able to keep costs down because I’ve never drawn a salary, but really, the secret to our success is trust. None of this would have been possible had it not been for the many unsung heroes who have risked it all by sharing critical information with us. We thank you, and we promise we will not let you down. 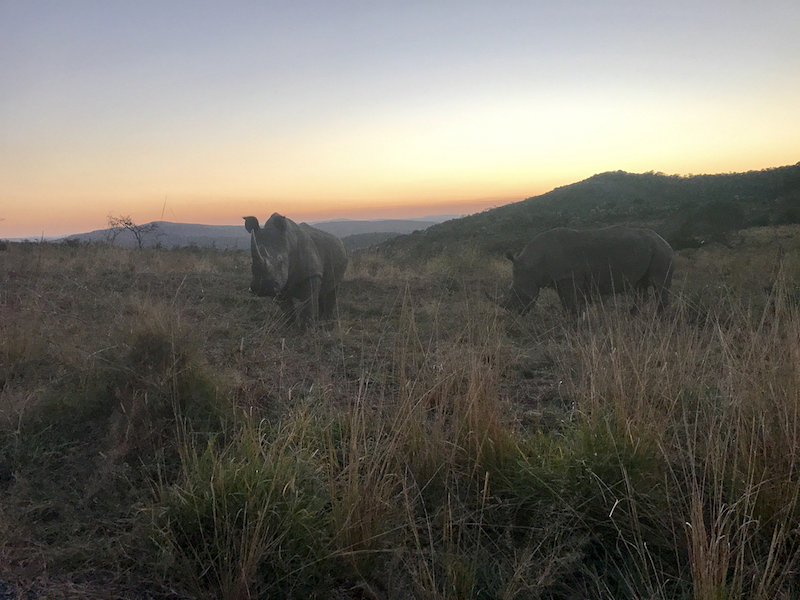 To the best of my knowledge, Saving the Wild is the only wildlife non-profit that is primarily focused on investigating corruption and high level targets involved in South Africa’s rhino wars, where 80% of the rhino population reside. We continue to work closely with trusted senior members of the police, trusted senior members of the National Prosecuting Authority, members of Parliament, and the Justice/Magistrates Commission, to ensure that information translates into meaningful arrests, and most importantly, convictions. The current conviction rate in South Africa is ashamedly low, and the law is simply not acting as a deterrent. In 2016, we published several investigative stories, exposing the accused rhino poaching kingpin of Zululand, Dumisani Gwala, and his allegedly corrupt relationships within the courts. Separate to Gwala, we published stories exposing various rhino poachers who were let off the hook whenever X defense attorney was in the room with Y magistrate. Originally, our work was built on intelligence from the field, and a project driven evolving database of rhino crimes where patterns began to emerge. We soon realised that the justice system is fuelling the rhino crisis. When a poacher is out on bail, there are situations where he is influenced to kill another rhino so he can pay bribes to crooked justice officials. Once exposed, accused magistrates began to behave like they knew they were being watched. 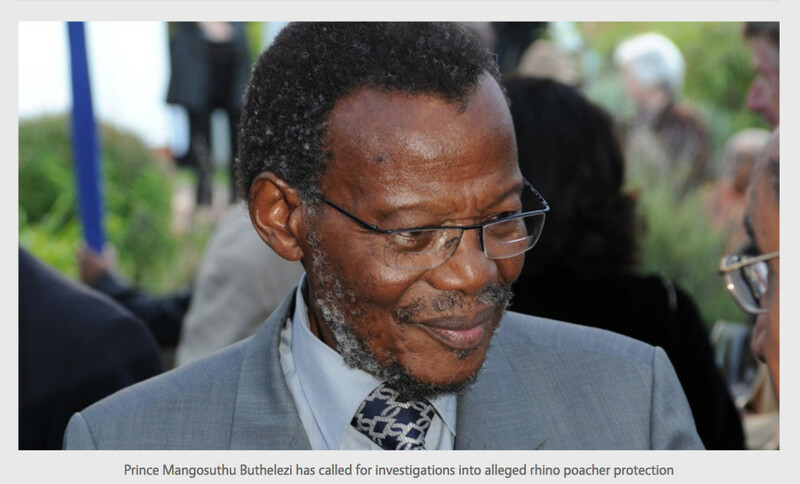 Ngwenya, the defense attorney known for representing most of the rhino poachers in Zululand, and the man we regard as ‘the deal maker’, stopped taking rhino cases – however there were still situations where he pulled strings from the shadows. January 2017, Ngwenya’s nephew and assistant ‘Fresh’ handed himself in to Saving the Wild. Our ‘blood rhino blacklist’ instantly tripled, and what followed was many months of intelligence gathering, polygraphing, and verifying of information by senior police members. Blood Rhino Blacklist and Rhino massacres, can Ezemvelo handle the truth? Whilst we are making significant progress in exposing the corruption inside the courts, it is heart-wrenching that Ezemvelo KZN Wildlife has still not publicly addressed rampant corruption inside Hluhluwe iMfolozi Park, and polygraphs have still not been introduced. We have since handed over a suspect list of Ezemvelo employees to both police and to Ezemvelo’s acting CEO, and are waiting on their own internal investigation to be completed. We have also been supporting the state appointed Rhino Crime Combatting Task Team with their investigations since June 2017, and when their report comes out in early 2018 it will likely reiterate most of what was published in our Ezemvelo expose. The wheels of justice turn slowly, and it takes an incredible amount of patience and perseverance to battle on, and there is still much work to be done. We expect the next two years to be a gruelling uphill battle in the pursuit of bringing justice back to Zululand, home of the rhino, and home to the great Zulu nation. A huge appreciation to everyone out there who is cheering us on. “Saving the Wild is doing invaluable work on behalf of our rhino. I admire their courage to speak out on the corruption that is preventing justice from being done. As a lifelong conservationist, I am cheering them on as we work to protect what is our living heritage”. August: Investigations into Hluhluwe iMfolozi Park begins. 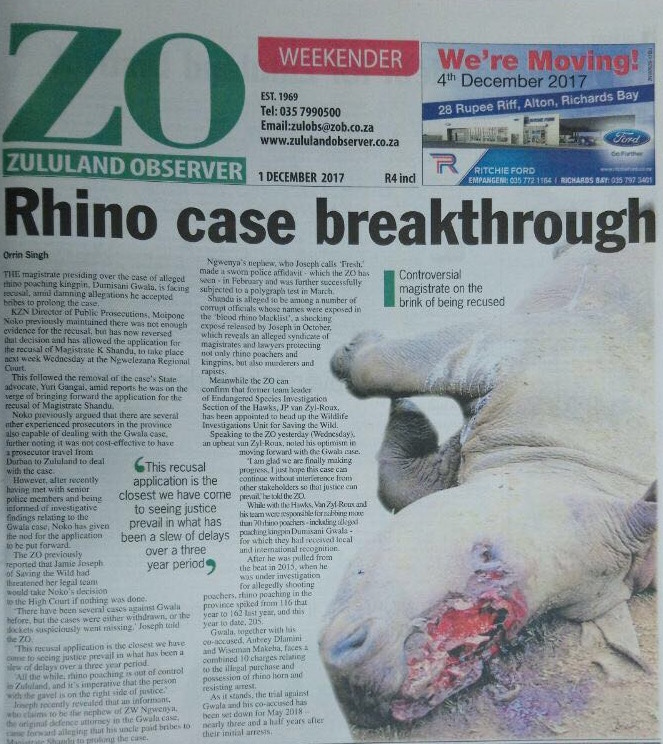 October: Rhino Massacres, Can Ezemvelo handle the truth? 2018 and beyond: Conservation Guardian Network (CGN) – Empowering rural community members to be guardians of wildlife reserves. A model that can scale. •	Manage an informer network aimed at addressing wildlife crimes. •	Briefing and de-briefing of sources with the subsequent evaluation and decimation of intelligence gathered. •	Strategic and operational planning of pro and reactive actions initiated to address rhino related crimes. •	Liaison with law enforcement, local and specialised units. •	When necessary, publish findings and encourage political will with the support of a groundswell of local and international support. 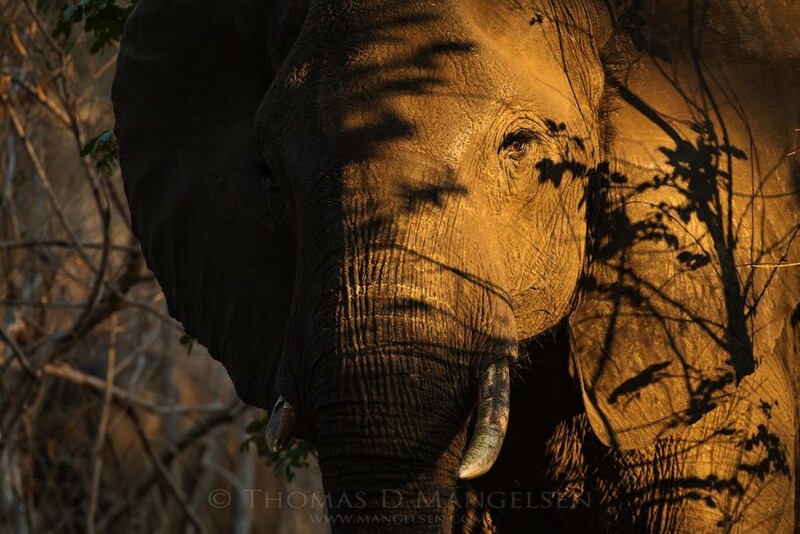 •	Behind the scenes, work with various stakeholders to turn the tide of poaching. •	Collaboration and regular communication with private and state rhino owners and managers, wildlife trafficking agencies, and organisations with a vested interest in combating wildlife crime. •	Assist law enforcement with preparation of court related dockets. •	Assist law enforcement with specialised investigation skills. •	Assist law enforcement with tracing of wanted suspects. •	Support development of a framework to strengthen interagency protocols to prosecute and adjudicate crimes relating to wildlife trafficking. Effective 1 December, Saving the Wild is thrilled to announce the appointment of JP Roux as Head of Wildlife Investigations. His impeccable record and extraordinary commitment to South Africa’s rhinos and the anti-poaching community speaks for itself. Traditional journalism is dangerously limiting. The story of the demise of the rhino is based on official comment that is often watered down. Activist journalism takes the story from the field to a platform where global citizens can be alerted to what is really going on, and then assume their role in asserting pressure and driving political will. Gwala is brutal by nature, and widely known among poaching circles and law enforcement as a man who rules by the gun. There have been several cases against him before, but the cases have either been withdrawn, or the dockets have suspiciously gone missing. While Gwala claims he is unemployed, the Asset Forfeiture Unit seized six luxury vehicles from his premises worth millions; including a BMW X5 and a 3-series, a Mercedes Kompressor, a Toyota Land Cruiser and a Prada. Magistrate Ngcobo released some of his vehicles that had just been seized. South African Police Services (SAPS) immediately obtained a court order to repossess the vehicles, but when the Asset forfeiture unit arrived at his house to collect the vehicles, he stood defiantly at the entrance with a five litre container of petrol and threatened to burn all the vehicles if the officers came any closer. The officers left and he quickly stashed all the vehicles. Outcome: Magistrate Ngcobo was immediately removed from the Gwala case. No official reason was given. The month of February was spent trying to hand over our ‘blood rhino blacklist’ to either the Hawks Head of Police, or the Minister of Environment, Edna Molewa. Meetings were set up, but neither the Police Colonel nor the Minister showed up. It was becoming increasingly clear that senior members of the South African government didn’t want to deal with the corruption enabling rhino poaching. It’s an incredibly slow and arduous task trying to gather up information on specific rhino cases, but we knew the gold would be in the data. 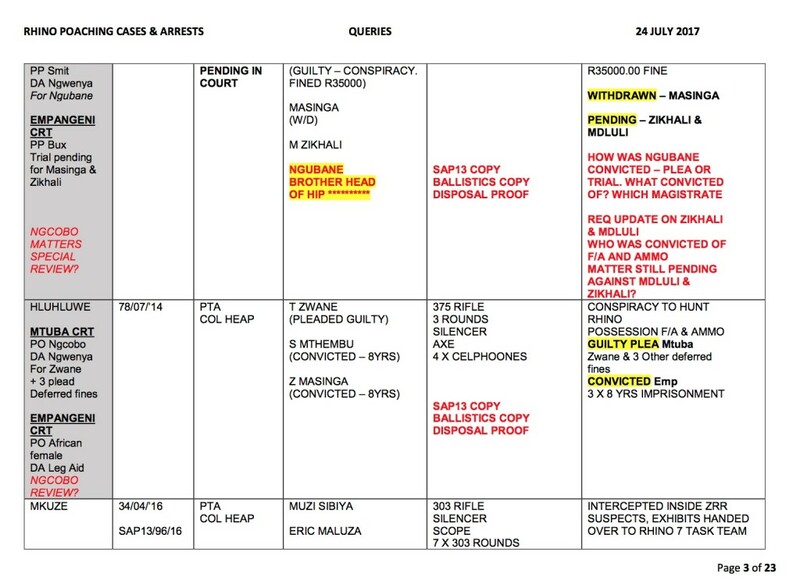 As a follow up to the January expose, we began publishing specific cases highlighting the relationship between Magistrate Ngcobo and the alleged ‘deal maker’, defense attorney ZW Ngwenya. While poaching in KwaZulu-Natal is in fast forward, the prosecutorial system in some areas appears to have gone into reverse. 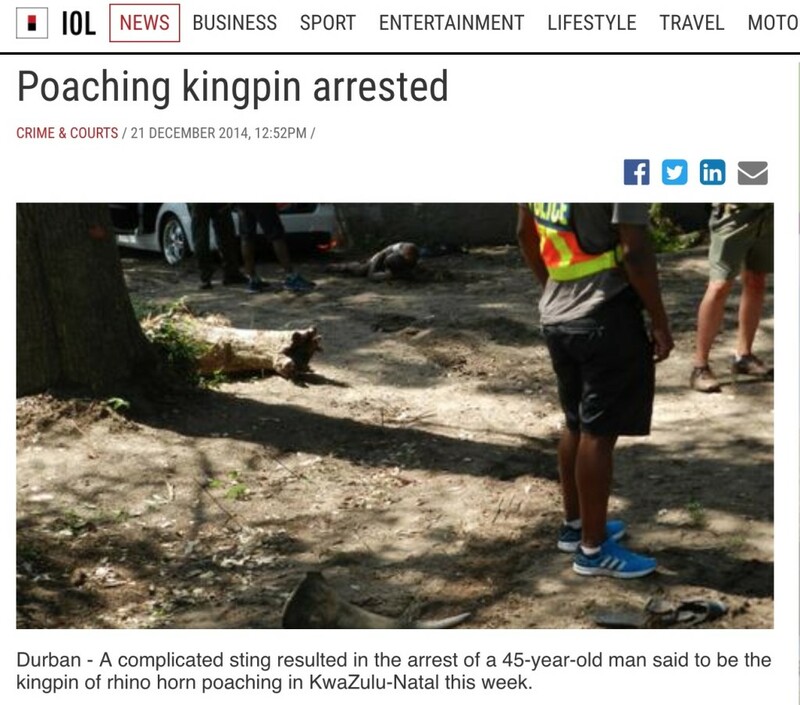 Many of the worrying poaching cases are linked to a magistrate, Deuteronomium Ngcobo, and a defense attorney, Mr Z.W. 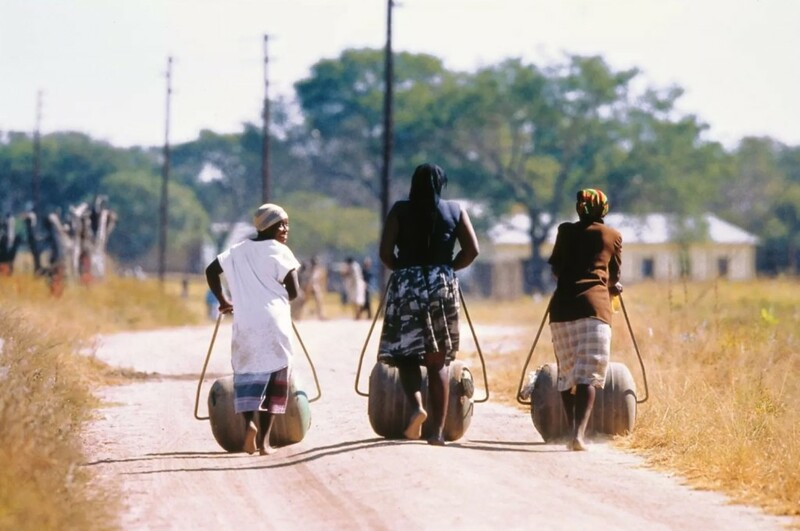 Ngwenya. 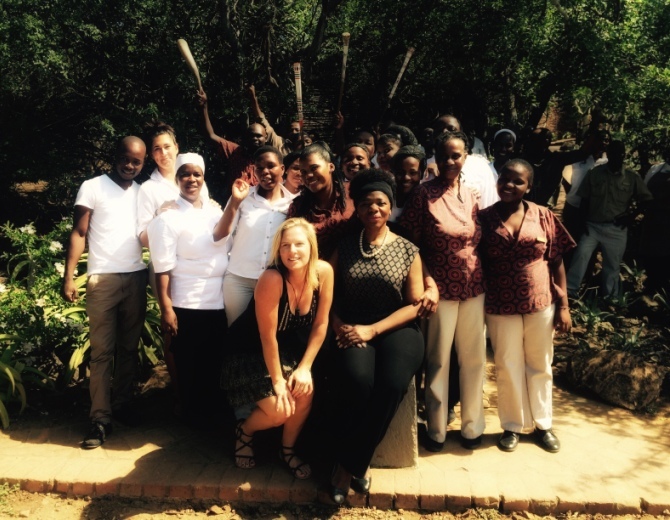 Advocate Thuli Madonsela and Jamie Joseph joined by staff at Phinda Private Game Reserve. It took nine weeks and countless emails and phone calls to finally get a meeting with the revered Public Protector of South Africa – a breakthrough considering there were no senior members in the South African government showing any interest in us handing over the names and evidence relating to our ‘blood rhino blacklist’. An hour into the meeting, Advocate Madonsela opened a preliminary investigation into the corruption enabling rhino poaching. It was a boost to the fatigued conservation community, and it validated our work. Unfortunately Advocate Madonsela’s term ended soon afterwards, and we made the decision to cut all communication with the Public Protector’s Office as our faith had been put in Madonsela herself. But the effort was worth it because it commanded the attention of key stakeholders. In June 2016, Saving the Wild took aim at magistrate no2, Magistrate Mkhwanazi, the brother in law of defense attorney ZW Ngwenya. Questionable legal decisions need to be addressed as clearly the law is not acting as a deterrent; such as the pattern emerging when Magistrate Velengaziwa Mkhwanazi of the Ubombo court resides over rhino poaching cases in Zululand. Luck finally ran out for convicted poacher Musa Sibaya when he was arrested in Pongola last year with a group hunting rhino. (Case number 70/07/2015 Hluhluwe) In his previous arrest he was represented by defense attorney Ngwenya and went before Magistrate Mkhwanazi. He pleaded guilty and was let off with a fine. But on his most recent arrest he had a different lawyer and went before a different magistrate; Magistrate Badenhorst in the Hluhluwe court denied him bail and he is currently locked up behind bars awaiting trial. 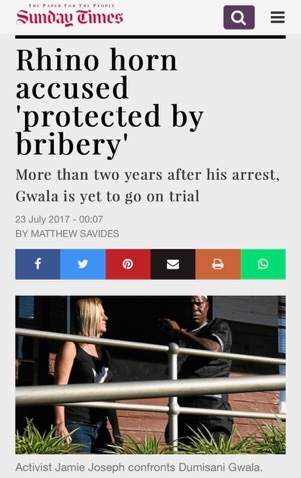 Finally, 18 months since Dumisani Gwala’s arrest, in July 2016 the Gwala Syndicate broke into mainstream news when police affidavits began to emerge. An extract from this story was published in The Mercury. The point of highlighting this is to show how long it often takes for high profile targets to even break into the news. Journalists in South Africa are inundated with breaking news in a country that is drowning in an abundance of corruption allegations that go straight to the president. The rhino crisis, after a decade long war, does not get the attention it once did. There is a growing need for dedicated, independent environmental journalists to support mainstream channels. In a second operation, two policemen, wired with recording devices, gave Gwala two rhino horns which he said he would sell in Mozambique. Again he short-changed them, giving them R65 000 and promising another R150 000 at a later date. Gwala was arrested during the third operation, but he did not go down without a fight. Van Zyl Roux said the undercover agent – with a special task force member hiding in the boot – met Gwala on the side of a gravel road. He said when Gwala, who was bleeding, was removed from the car he was “still fighting”. He had managed to disarm the task force member during the struggle. Shots were also fired. For the record: Saving the Wild was introduced to then Hawks Detective JP Roux only AFTER we published our first expose on the Gwala Syndicate. Throughout the second half of 2016, Jamie Joseph spent extensive time inside Hluhluwe iMfolozi Park as rhino poaching began to soar in the KwaZulu Natal province. 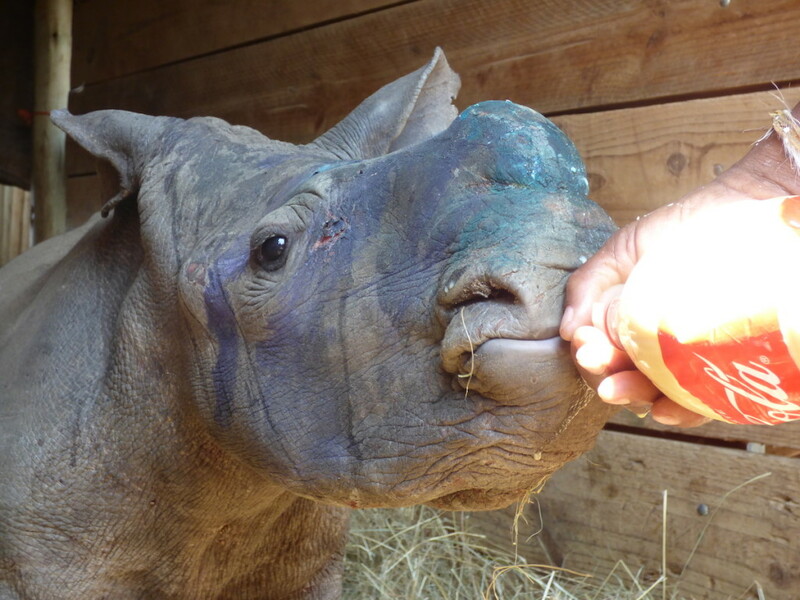 She was present for various rhino massacres during full moons, and built up the trust of many employees over a 14-month period. The park is split up into five sections, and rhinos kept getting killed in the Masinda section, under very suspicious circumstances. It’s difficult to talk about this investigation because it involves many employees that work for Ezemvelo, and there is this constant fear that they will lose their jobs if they speak to the press. But because Saving the Wild has painstakingly living through the crisis with them, we are able to understand the internal struggle. Through our investigations, it was becoming increasingly obvious that some people who were put in charge of protecting our wildlife were the ones causing the most damage. Jamie Joseph is on a crusade to fight rhino poaching. The environmental activist has spent countless nights in game reserves across South Africa, networking with rangers and community leaders who feed her intelligence on poaching. She has used her website to highlight how alleged corruption within the justice system is fuelling poaching. 2018 and beyond: Conservation Guardian Network (CGN) – Empowering rural communities to be guardians of wildlife reserves. A model that can scale. “I met Fresh at the start of 2017. I had been contacted through our NGO website, savingthewild.com, and the person claimed to have information on corruption relating to the Gwala case. I immediately called State Advocate Yuri Gangai, and he instructed Hawks Detective JP van Zyl Roux to accompany me to the meeting with the source. Back at the Hawks Police Headquarters in Durban, a young man that I would later name ‘Fresh’ to protect his identity, began confessing that he is the nephew of Gwala’s original defense attorney, ZW Ngwenya, and explaining how he had been sucked into a life of crime while working for his uncle. Over a two-year period, 2015 and 2016, he claimed he had been instructed by his uncle Ngwenya to hand over large amounts of cash bribes to many magistrates and prosecutors in Zululand. I think for Detective Roux, and for myself, we were thrilled to have such a breakthrough, but it was devastating to hear the vast extent of the corruption. 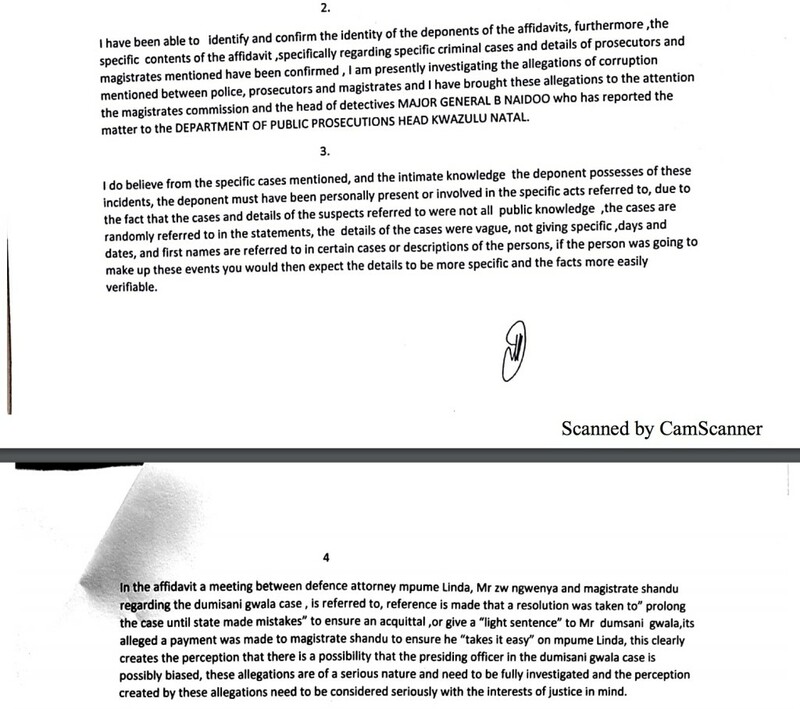 Fresh showed genuine remorse, but I’m cautious of everyone I encounter, and it was only after he made his sworn police affidavit in February, and then we polygraphed him in March that I started to truly believe. In June of this year, I was handed over to a Lieutenant Colonel who is investigating the top layer – allegations that KwaZulu Natal Regional Court President Nzimande took bribes in exchange for appointing magistrates. Suddenly all the pieces of the puzzle began to fit together. The Lieutenant Colonel then spent a few months verifying Fresh’s affidavit, and, finally, after arranging Fresh’s safety, it was time for the truth to come. 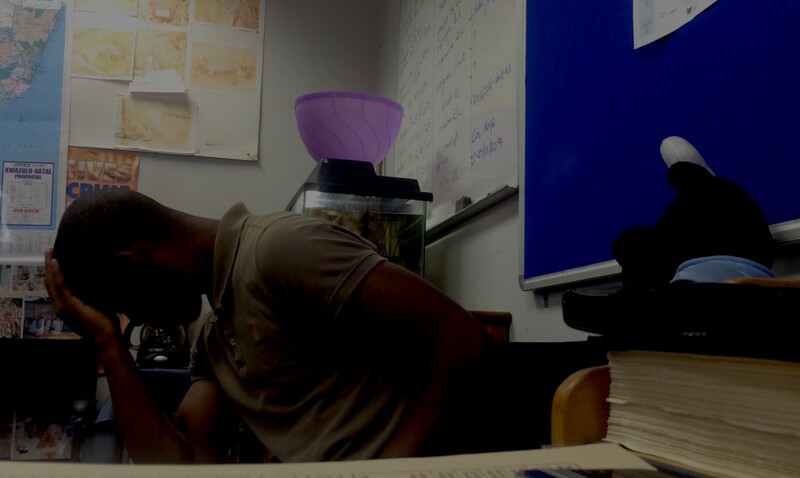 After meeting Fresh we began comparing our intelligence from the field with his first-hand knowledge of attending countless court appearances with his uncle, defense attorney Ngwenya. What was most shocking to us is even magistrates we thought were on the side of justice, had allegedly taken the occasional bribe – thus why there was a sudden spike from good convictions – to a petty fine and no jail time – and then back to good convictions. It was at that spike that Fresh claimed he had paid off the magistrate on behalf of his uncle. Over the past two years we have developed a database of most of the rhino poaching cases in Zululand, and our legal team has done an excellent job in collecting the data and following up on suspicious sentencing. From here we take the data to the police and the Magistrates Commission to help them with their investigations. 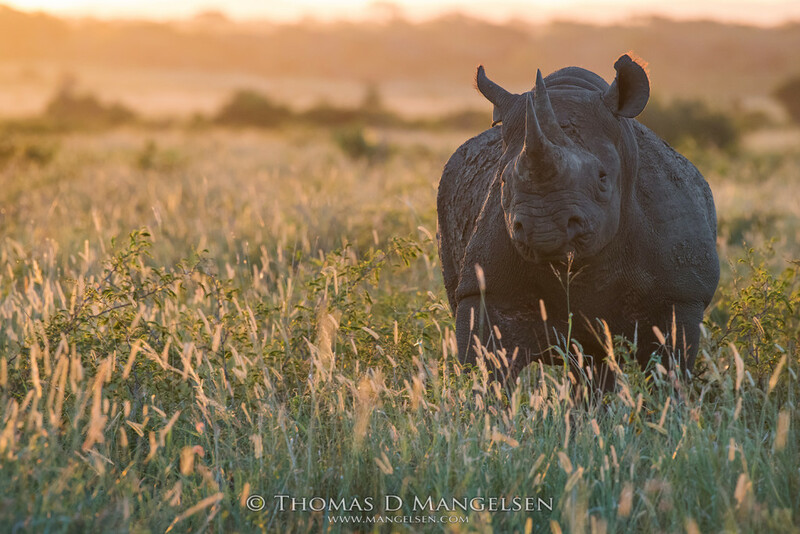 On June 1st Saving the Wild was a beneficiary of a photographic event that raised US$165 000 in the fight against corruption, specifically for rhino projects in Africa and in Asia. The 10 August payment won’t be reflected in the end 30 June 2017 financials, thus why we have included it here. Funds are dedicated to exposing and eradicating corruption enabling rhino poaching. This includes the Saving the Wild legal fund to support rangers and police with their investigations – arrest to conviction – and if they are targeted for going after poachers with political protection. A portion of these funds were critical in helping us complete the investigation on the ‘blood rhino blacklist’. 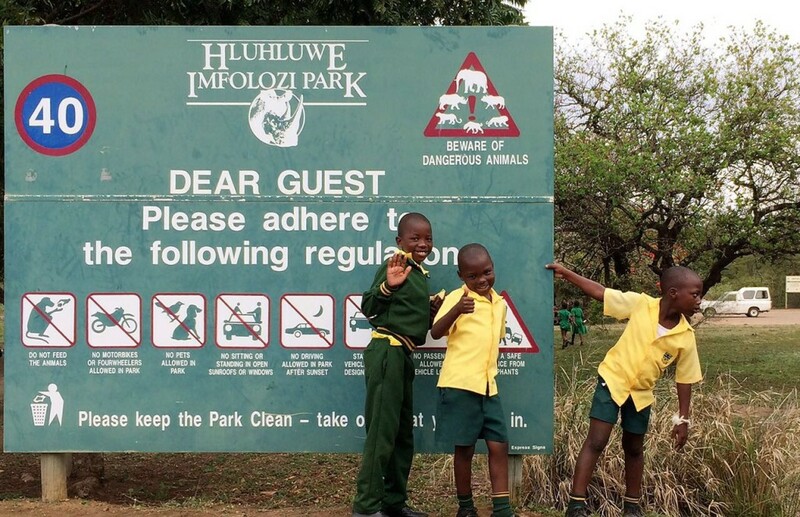 Some funds have been ring-fenced for polygraphing for Hluhluwe iMfolozi Park, and we are currently waiting on a decision by Ezemvelo on how they would like to proceed. The rest of the funds will be spent on new investigations in the coming weeks. Huge appreciation to everyone that bought a rare limited edition print by Thomas D. Mangelsen; art as a force for good. Where possible, rather than publish a story on Saving the Wild, we will hand over all our evidence to mainstream journalists. In some situations, such as the Ezemvelo expose where sensitive information is passed on from Ezemvelo employees directly into the trust of Saving the Wild, and they will never go on record for fear of losing their jobs, passing on sources to journalists is not possible. But with the alleged bribe between attorney and magistrate in the case of Dumisani Gwala, it was a straight forward process where sworn police affidavits existed, and information could be verified by the Sunday Times. Saving the Wild never just publishes a story and hopes for the best. We spend a huge amount of time ensuring various stakeholders are properly briefed and have access to the information that substantiates our claims. We do not align with any one political party, but we understand the value of having a voice in Parliament, and are grateful to the various parties that are pushing forward with the agenda of exposing the corruption enabling rhino poaching. In August 2017, Saving the Wild Director Jamie Joseph, and nature photographer Thomas D. Mangelen, joined forces to see how they could support the elephant crisis in Zimbabwe. While in country, Saving the Wild spent US$1000 supporting a police investigation that resulted in the arrest of alleged poachers behind cyanide killings. These very rare limited edition prints start at US$2000 each. Two events are planned for 2018; one in New Zealand, and the other in the United States. After more than one year of on the ground investigations, and many devastated Ezemvelo employees providing us with critical information, we published the Ezemvelo expose. Hluhluwe-iMfolozi Park (HiP), once a global conservation success story for bringing rhinos back from the brink of extinction in the fifties, is fast becoming a graveyard and failure of epic proportions under the helm of Ezemvelo KZN Wildlife management. Saving the Wild has been closely monitoring the Zululand park since July last year, and our environmental organisation is a trusted ally to many of the employees inside HiP who feel they are not being supported. The poaching death toll in the KwaZulu-Natal (KZN) province of South Africa has now surpassed 200 butchered rhinos, and most have been killed inside HiP. Of the 162 rhinos killed last year in KZN, 118 were poached in HiP, compared with 28 in 2015 – an increase of 320% – and it’s escalating. The new ground zero in these rhino wars, the killing will continue unabated until competent management is at the helm. As shocking as these revelations are, Saving the Wild stands by every word that was published in the Ezemvelo expose. Frustratingly, journalists have not been able to get a comment out of Ezemvelo, who are not in a position to deny any allegations made. Saving the Wild has since handed over a suspect list of Ezemvelo employee to both police and to Ezemvelo’s acting CEO, and we are now waiting on their own internal investigation. We hope, moving forward, to have a productive relationship with Ezemvelo / Rhino 8 Police, and support them with intelligence that will enable the police to arrest more poachers. Very brave, passionate and committed Ezemvelo rangers are being forced to work alongside traitors. As absurd as it sounds, rhino horn is worth, gram for gram, more than diamonds or cocaine, and it is inevitable that some employees would end up working with poaching syndicates. Over a two-year period, 2015 and 2016, Fresh claimed he had been instructed by his uncle Ngwenya to hand over large amounts of cash bribes to many magistrates and prosecutors in Zululand. I think for Detective Roux, and for myself, we were thrilled to have such a breakthrough, but it was devastating to hear the vast extent of the corruption. Screenshot: Extract of a police colonel affidavit that was NOT submitted in the recusal application of Magistrate Shandu on 9 October. 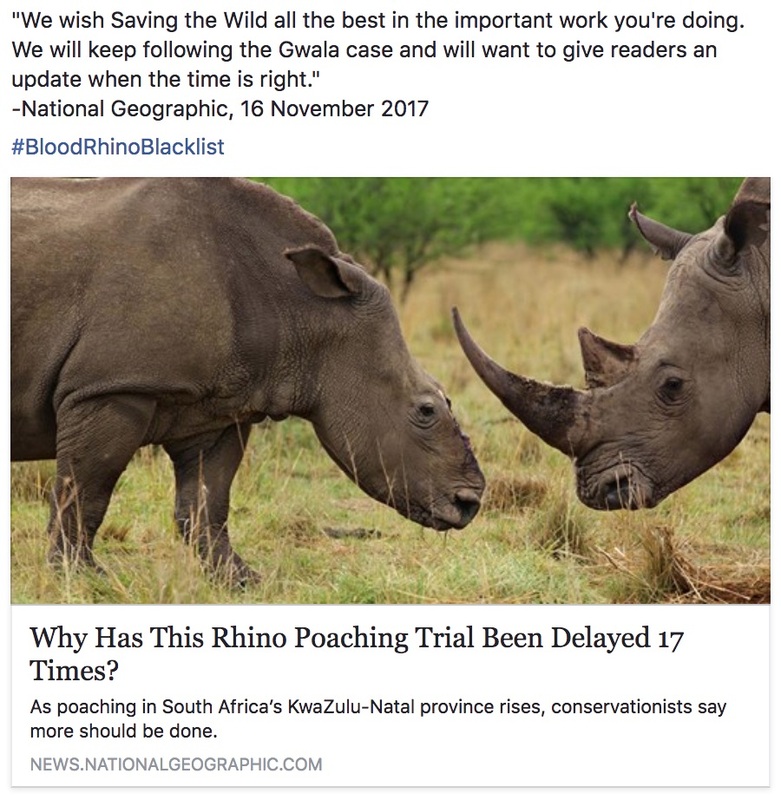 The NPA later reversed their decision to stop the recusal application following the publication of Saving the Wild’s ‘blood rhino blacklist’ expose and a meeting with senior police members. The recusal application of Magistrate Shandu never went ahead on 6 December because Gwala’s defense attorney, Miss Mpume Linda, refused to attend in the final hour – claiming in correspondence with the state that she would only attend a new recusal date if the state paid her travel. After two years of campaigning to ensure Gwala is not acquitted, as with all his previous arrests, we believe we are finally on the right track to justice. Trial dates have been set for May, and we have faith now that the person with the gavel will be on the side of justice. As a first line of defence Nyathi Anti Poaching employ several community guards, male and female, that do not wear a uniform and who get paid a salary each month. Nyathi train them in first aid, security, and conservation law enforcement – their job is to serve both their community and Anti-Poaching. They report any suspicious vehicles, people enquiring about the reserve, and any other people unknown to the community. They also report on meetings between poacher groups and any other suspect people entering the community. Read the full story on Virgin Unite. The cost of a community guardian is R10 000 (US700) per month. Ultimately, Saving the Wild aims to dramatically reduce the spend on intelligence by 2020, and replace ad hoc intelligence by funding a Community Guardian Network (CGN) right across Zululand. Even when the rhino crisis ends, these last great wild places will always need to be protected, and through meaningful employment we can save not only animals, but stamp out poverty and empower rural communities to be guardians of their natural heritage. A Q&A industry event will be hosted by Saving the Wild in the first quarter of 2018. For year ended 30 June 2017 – Read full financial report on NZ Charities website. Whilst we deeply appreciate ever dollar donated, less than 2% of our donations come from social media (NZ 1730). We pride ourselves in keeping the public up to date, we very rarely ask for donations, but we do count on the engine of public awareness to drive political will. 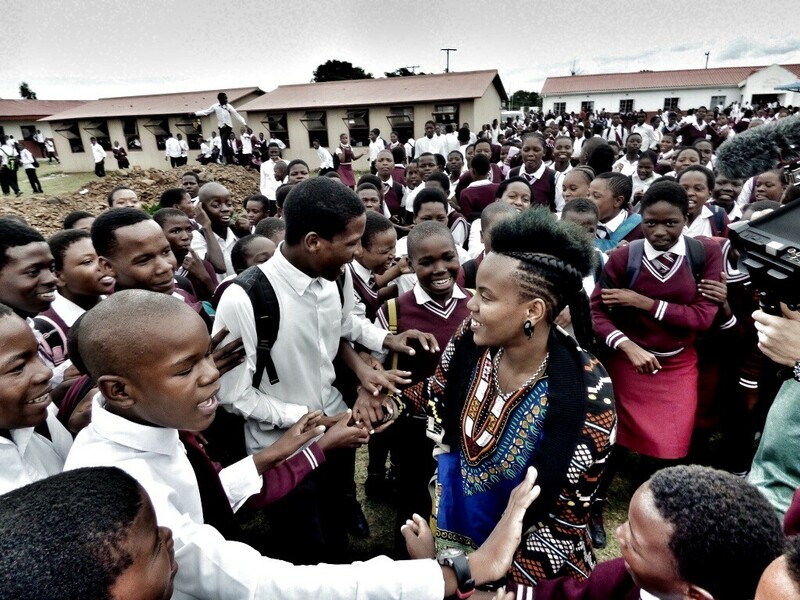 There will be a very special opportunity in 2018 for everyone to get involved when we launch our first crowdfunding campaign for an empowering ‘music as a force for good’ project hosted by Zulu Princess and rising international music sensation, ‘Toya Delazy’. Because our work is built on intelligence, and most of what we do is unseen, we have found the best fit for us is to spend considerable time regularly briefing only a small handful of philanthropists and other environmental NGOs that understand the true value of exposing and eradicating the corruption enabling wildlife poaching. Often its more than just a financial donation, their skills and experience contribute towards our goals. All major donors have full access to financials and strategies all year around. Philanthropists can contact Saving the Wild Director, Jamie Joseph, to set up a call to discuss the 2018-2020 strategy. Jamie was born in Zimbabwe and raised in South Africa, with much of her childhood spent in the national parks. A British subject, she is a New Zealand resident and worked as a freelance environmental journalist and strategist in NZ between the years 2011-2013. (JNJ Communications) In 2014 she invested her life savings into Africa’s poaching crisis. At the end of each year, Jamie returns to New Zealand for trustee meetings, financial reporting, meetings with donors, and to reconnect with a network of social entrepreneurs that have been quietly supported Saving the Wild since 2014. Please join the crusade for justice on Saving the Wild Facebook and Twitter #BloodRhinoBlacklist #JusticeForZululand.